Were are finally getting some much needed rain and you can tell already that our gardens are thankful! 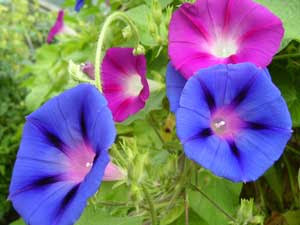 At left, our beautiful Morning Glory Vines...a perennial here, they grow fast on fences & arbors and are very hardy. Sat. Morning Market News--as of last week, we are in the countdown for the last 3 weeks of market here in St. Pete, but this week, found out that the market team is working on continuing the market into the summer, and they are awaiting final approval from the City. The summer market location would be in the Mahafee Theater complex, just a few short blocks south from the baseball stadium lot where we are currently. The proposal is for the market to be located on the ground floor of the parking garage, which give vendors and customers protection our summertime heat and thunderstorms. Customers would be able to park in the upper levels of the garage, then just come to the ground floor to enjoy market. This means plenty of nearby parking, and they are hoping to only have a $1 parking fee, which would be great, considering most of the area parking garages charge at least $5. Keep checking back with us, or the local newspaper for more info, but it looks like a "go" and that means you can continue to enjoy market and, enjoy our plant offerings during the summer! Also, we will be taking part again in the annual St. Pete Clay company Garden & Art Show the weekend of June 6 & 7th. Show hours are 10am to 4 pm. We had a great turn out last year, and customers enjoyed touring and buying from local artists located inside the building, and we had brisk sales on our tropical plants. There is live music, food and drinks ! For more info, check out their website at www.stpeteclay.com. We hope to see you there. Also, we are working on setting up a date for our annual Summer Plant Sale at our house in St. Pete. We are hoping to do it the second weekend of June, pending City approval, as they now consider our sale "an event" and are asking for approval and fees. Meanwhile, come on down to market, or give us a call if you are looking for plants. This is a great time to finish getting specimens in that will thrive with our coming summer rains (we are optimistic!). We still have tons of great stuff for indoors and out !